I love Sourdough Bread! But eating Gluten-Free means there’s not much bread in my meal-plan, unless I’m creative. This week I made an amazing Gluten-Free Sourdough Bread with Dairy-Free Coconut Kefir Water, and Coconut-Cashew Kefir milk. My mouth is still watering just thinking about it… And I’ve got a few leftovers still in the fridge! 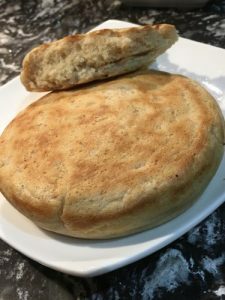 I’m always posting food pics on my personal Facebook page… and this week, my Gluten-Free Sourdough Pan Bread was extra fluffy, and yummy. I just had to post a pic. After seeing the photo, a bunch of my friends all wanted the recipe. It’s rare that anything I cook ever looks or tastes the same for me twice. I don’t measure anything, and hardly ever follow a recipe. But thankfully I jotted down my ingredients for this one. Finger’s crossed if you decide to give it a try, I hope it comes out as tasty as mine did. Posted by administrator in Food and Nutrition, Recipes for Healthy Eating, Uncategorized. 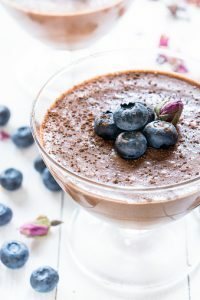 This protein-packed chocolate pudding really is one of my favorite “comfort” desserts (also great for breakfast, lunch, or an afternoon snack!). Eating this brings back memories… When I was a kid, my Aunt Rachel made the best Chocolate Cream Pie on the planet! For every holiday, birthday, or special family get-together, she always made me a chocolate pie. In the early years, she’d ask what I wanted for dessert. But after a while it became obvious that she could ask, but my special request was always going to be her amazing chocolate pie! I miss both her, and her pie, dearly…I suppose that’s why I have such sweet memories every time I take a bite of this pudding I whipped up one day on a whim. I keep thinking that I’m going to get some of my favorite recipes compiled into a cookbook. But when you’re somebody that cooks by the seat of your pants, rarely making the same thing twice…it’s a challenge to nail down a recipe. Recipes to me are more like suggestions! A springboard from which to start making changes. And, since over the years I’ve dealt with tons of food sensitivities, allergies, and intolerances, the question of what CAN I eat that my body will take and use appropriately continues to be a moving target. So, if you’re anything like me, the ingredients below for my yummy protein-packed chocolate pudding with blueberries will be recommended “suggestions.” Feel free to modify and adapt based on your body’s desires and needs for the right foods. This is a sugar-free recipe (until you add the blueberries!). So, if you’re looking to cut sugar completely out of your life, you can still enjoy this chocolate pudding, just skip the fruit. Place all ingredients in a bowl, except blueberries. Use a spoon to hand mix until thoroughly blended. Add blueberries, stir, put on the lid, and refrigerate to let the chia seeds soak. Helpful hint – I usually make this in a Mason Jar. It’s easy, serving sized, and quick to make ahead to grab and go. It depends on how many calories you’re counting to calculate a serving size. For me, the recipe above is 1 very generous LARGE meal-sized serving (I estimate approximately 432 calories with a whopping 28.1 g of plant-based protein). Or 2 Medium-sized servings (approx. 216 calories). If you were into a 2-bite dessert you could probably make this into 4-6 servings! I happen to be a pudding pig and this usually becomes a high-protein, morning or mid-afternoon meal for me. Don’t have the Fuxion products in your kitchen pantry? Swap it out for something else (but I can’t guarantee the taste!). If you’re interested in ordering the Ganomas Cappuccino mix, and BioPro X Active Chocolate Hazelnut Protein Powder that I used in this recipe, or trying some of the other healthy sugar-free Fuxion functional beverage drinks that I enjoy and cook with regularly, click here to visit my Fuxion virtual shop scroll thru to find the products you want, and order a box today! It’s not my Aunt Rachel’s chocolate cream pie. But I know it’s better for me! Quick and easy, and oh so yummy. Give it a try and let me know what you think. Posted by administrator in Food and Nutrition, Recipes for Healthy Eating. Are you on the diet roller-coaster? Sadly, more than one in three Americans adults over 20 is obese, and nearly 70% are overweight or obese. And if this is the example we’re setting for our children, they are in worse shape than we are! The “diet” and weight loss industry is a multi-billion dollar revenue generator; but are people getting thinner and healthier, or sicker and fatter? It’s time to find better solutions to begin breaking the diet cycle for a healthy life! I’ve battled body image and had food challenges my whole life, and I don’t think I’m special. Sadly, I’m pretty sure that I’m a typical American female, who has bought into what people have said to me about my weight, and what TV and magazines promote to be “beauty” standards. I’ve spent most of my 50 years on this planet wishing I looked different and weighed less. And I know that I have spent more of my life thinking about dying than actually living! I share this with you because I know I’m not alone. There are a million options out there for companies willing to take your money and help you get your “diet” on track. A lot of them work and some are just snake oil, but ultimately you have to do the work! It begins with what you’re thinking about and HOW you honor your relationship with food. You can’t put water in the gas tank of your car and expect it to run. Why do we think putting all sorts of artificial everything into our body is going to fuel our cells and keep our body running optimally? What you eat matters. How much you eat matters. And here’s a hint… you will NEVER be able to exercise off the huge amount of excessive calories consumed in the typical American diet. When almost every meal is eaten out, and calorie consumption per meal is what you should be eating per day, there is only one direction your body weight is going to go, and that’s UP – at an alarming rate! If processed, junk food is your passion, your body is actually STARVING. When no actual nutrients are going in, you’ve got no fuel – lots of calories, but nothing that your cells can actually use to keep all systems functioning properly. It’s not rocket science, it’s common sense. Whether you’re a meat eater; vegetarian; or vegan, healthy whole-foods matter. But your body may be so toxic from poor choices, that it might take a while to flush the crap, (literally) out of your system before better nutrition can start re-building a healthy body. And if you don’t really have a good connection with your body, you might not even realize that some of the foods you’re eating are killing you! A friend of mine posted a comment on Facebook about being bullied for gluten intolerance. She has great insights. “You know when you make fun of someone who is gluten intolerant, it’s like making fun of someone with Cancer… We slowly die inside if we eat it. The side effects are terrible. We bleed inside ourselves. It’s no joke… Please keep your judgements to yourself… Unless you have seen what it can do, be quiet please.” Ruby R.
Aside from the emotional impact of having somebody make fun of the foods you can/cannot eat. It’s not just gluten intolerance that’s an issue these days. Look how many people have food allergies and food sensitivities. Diabetes is running rampant and so many inflammatory issues have food as a contributing factor, yet doctors don’t always see the connection. When diagnosed with Optic Neuritis, I was blind in one eye and on super-high dose steroids; desperately trying to regain my eyesight. I asked the Rheumatologist I was referred to about food and nutrition; I wanted to know what I could eat that might help me regain my health and sight. She laughed at me and said, “Nothing that you eat will make any difference.” This was the advice from a specialist that deals with inflammatory diseases! (I was quick to find a new doctor and like-minded experts who knew more about nutrition that could better guide me to figuring out what foods were contributing to my inflammation issues, and what foods actually helped reduce inflammation.) But if this the advice you get, and you BELIEVE it! You will continue to eat foods that might be contributing to your demise, regardless of the health issues you’re facing. Our body is a delicate eco-system. If anything is out of balance, everything is out of balance. We can compromise for a while, but sooner or later something will break, wear down, or stop functioning correctly. Food as Fuel is a critical component to maintaining a healthy body. Ask yourself this question: Do you Eat to Live, or Live to Eat? Is your body a Temple fueled by good nutrition, or are you a human garbage disposal? It sounds crass, but it’s the reality of the situation: whether the foods you eat are fueling your good health or causing you to feel sick, listless, and causing you to gain weight rather than maintain a healthy weight. Getting your body on track with a FOOD as FUEL Lifestyle isn’t going to happen overnight. But it’s not going to happen at all if you’re on the “diet” rollercoaster. Breaking the diet cycle is hard work, but isn’t your body worth it? Most importantly remember, food is your friend. Food is designed to keep your engine running for an active life. Make good choices, be more aware of what you’re thinking, AND eating to develop a healthy relationship with Food as Fuel so you can start breaking the diet cycle for a healthy life. One of the ways I’m making a difference in my life, with healthier choices to consume less sugar, and feed my body nutrients that it knows how to use is with Fuxion functional health beverages. (zero refined sugar, no high fructose corn syrup, no preservatives, no artificial colors, no artificial flavorings, no GMO’s.) If you’re interested in learning about the Nutraceutical, Weight Management, Athletic Performance, and Anti-Aging lines of products, and trying these great health products, check out this video, and contact me to learn more. Posted by administrator in Food and Nutrition. Are you interested in focusing on making better food choices for a healthy breakfast to nourish your whole-body health, but have a hectic busy lifestyle and find yourself eating on the run, more than sitting down for a relaxing meal? While chatting with participants in my Pilates group training class this week, we got on the topic of food, nutrition, and healthy eating habits. What to buy, how to shop, and what the heck to eat for a healthy breakfast, when you’re in a hurry. I believe we really DO know what we should be eating to stay healthy, it’s just there are so many options for tasty crap out there, that we’ve been fooled into thinking we’re actually getting nutrients with our wasted empty calories when we choose to eat fast-food, and junk! Honestly, it doesn’t take any more time to fix yourself a healthy breakfast than it does to wait in the drive thru lane. You just might have to actually remember you have food in the fridge and take five minutes before you dash out the door to grab it and go! I have to admit, I’m just like my clients, and don’t take a lot of time to plan for breakfast (or any meal for that matter!) And I LOVE to cook. But don’t always take the time to fix meals. And with the myriad of food allergies, and health issues I’ve had over the past couple of years, I much prefer fixing my meals instead of eating out! I can gain 5+ pounds with 1-2 meals eaten out. Do this regularly and it’s no wonder why Americans getting fatter instead of skinnier. My whole body feels better with good nutrition, and I know yours does too. Our bodies are begging us to make better food choices. And a healthy breakfast is the best way to start the day! If you’re one of the millions of busy folks out there who eats out more than you fix and pack meals and snacks, I want to encourage you to commit to a week of healthy meals that you make at home and take with you! Maybe it’s only making a change to fix and pack healthy breakfast meals for the week. Or go for it – and commit to fix ALL your meals and snacks. I’d be curious to know how your body feels after only one week of better nutrition. In my group class discussion about healthy breakfast ideas, one of the comments was, “I’ve got to be able to eat it while I’m driving to work!” Sadly, too many of us are in this situation… Multi-tasking meals means you’re not really paying attention to what you’re eating. Your brain-body connection (stomach-to-mouth) is not the main priority when you’re driving. The brain has to focus on what you’re doing to dodge traffic and stay safe on the road. It’s not any different than eating while watching TV or a movie, or “working thru lunch” and chowing down while working on your computer or skimming thru posts on Facebook or Pinterest on your phone. If you’re disengaged with what you are feeding yourself, you’re not going to realize how many calories you’ve eaten to know when to stop, or even realize when you’re full. Please keep this in mind my busy friends…paying attention to what you’re eating, and how much, and enjoying every morsel is a part of the nourishing experience of good nutrition. Prepare your healthy breakfast meals in small plastic containers, or small glass mason jars. Snack size zip lock bags can also help with portion control. Prep breakfast for several days (or the whole week) so it’s easy to grab & go. Eat your leftovers for breakfast. Who says breakfast has to be breakfast food? (I have a friend who eats a salad every day for breakfast!) Why not? Granola and Nut Butter plus a fruit, a healthy food bar, nuts and dried fruit, scrambled egg and spinach, protein pancakes or waffles (easy to make ahead and store in the fridge, smear on a little nut butter and jelly you’re good to go!) Paleo Balls (another easy to make option that stores and packs easily for a quick snack or a meal.) Grits are another favorite of mine…I even like them cold. Grits + cheese + a tsp of jalapeno juice, and if you want a little more protein, add a hard-boiled egg – YUMMY! If you’ve never experimented with sushi rice, here’s another idea for you. Follow the directions to cook the sushi rice (sticky rice). Then choose what you want to mix in. For a sweet healthy breakfast: Mix in chia seeds or sesame seeds, chopped nuts, dried fruits, and/or coconut flakes, and maybe some nut butter or honey. For a savory breakfast: Mix in scrambled eggs, cooked chopped veggies, cooked sausage, or chicken, or bacon (pick a protein), and your favorite herbs. Lay a piece of parchment paper in the bottom of your pan, and put the mixture in and pat firmly. Let chill, then slice and wrap for a simple healthy breakfast you can grab and go. I haven’t mentioned oatmeal, or yogurt, or juicing, and who’s to say you can’t eat hummus and veggies for breakfast? Or drink a nice warm bowl of chicken soup? Oh and I’m a big fan of meatballs. You can make a big batch and freeze them in little to-go-bags. I make mine with chicken and zucchini, or turkey and zucchini, or beef and radishes… Gives me a protein and veggie in every bite. And meatballs are every bit as good cold as they are heated up. I’m getting hungry just thinking about all the good things I can eat for a healthy breakfast! Hope you’re inspired to focus on food and make some healthy breakfast choices this week. Please drop a comment and share your favorite fast healthy breakfast meals. Love to see what we can add to this list to help you make healthy breakfast choices with your busy schedule. We are what we eat. Feed your body good food. 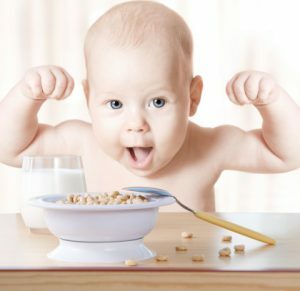 Start every day out right with a good healthy breakfast to fuel your engine for a fantastic day! Healthy Sugar-Free Chocolate Recipes – Yummy! You’ve got to try these Sugar-Free Chocolate recipes made with Stevia. These Chocolate Bites (Bombs) are Yummy! In the picture the lighter chocolates are my Cappuccino Chocolate Bites, and the darker ones are Double Chocolate Almond bites. Trust me, you’re going to want to make these sugar-free chocolate recipes. I Love Chocolate! Bet you do too if you’re reading this. I’m celebrating a 30 pound weight-loss since Thanksgiving, and am working on re-setting my metabolism to maintain my new “skinny” weight. Sugar and fat have been non-existent in my diet for a while, which has meant no chocolates or desserts (other than fruit, which can be very satisfying.) But OH fruit with Chocolate tastes so much better. And it’s funny, while I used to consume too many calories (and not always the best types of calories) which had my body gaining weight, holding onto inflammation, and hyper-sensitive to way too many foods. I’m now able to eat a lot of things that used to bother me, and now I’m actually finding it difficult to get in all the calories I need to be consuming daily to maintain my weight! Which is how I found these fabulous sugar-free Chocolate recipes. And of course because I find it completely impossible to actually follow a recipe, I’m now off on a tangent creating a bunch of new variations to taste and try! I’m listing my first two recipes in this post since after posting this pic of my chocolates on Facebook, I had a bunch of people begging for these recipes. They are super-easy to make, give it a try and let me know what you think. Place in freezer until solid. 5-10 min. By my calculations the entire recipe is approximately 465 calories. So depending on how many you make, divide 465 by the number of bites and you’ll have a per bite calorie count. I ended up with 15 little chocolates so approximately 31 calories each! If you’re using ice cube trays you might have bigger bites and more calories per piece! These are the “BOMB!” So yummy! 1 T Cacao Brew (fine-ground roasted cacao beans) World Berries brand from Natural Grocerers. A tad higher total calories on this recipe 562, but I poured more bites out of this, 20 to be exact, so my actual per piece calorie count came out to 28 per bite. Do the math, it will depend on how big your bites end up being. These are such a great alternative to a candy bar! Healthy fat, sugar-free, and YUMMY! I’m sure once you whip up a batch, you’re going to start creating your own delicious flavor combinations. Have fun making healthy sugar-free chocolates in your own kitchen with these two sugar-free chocolate recipes. The Cappuccino Packets that I used to flavor my Cappuccino Chocolate Bombs is from a new company called FUXION, that’s in pre-launch in the USA (and full disclosure, I’m an independent business owner, and super-jazzed up about these products and the company!) The FUXION product used in my cappuccino chocolate bites is Ganomas Café Cappuccino USA, this product makes a fabulous drink, and I’ve got another recipe or two to share that I’ve come up with using this. (P.S. I didn’t use to like coffee, but LOVE drinking this!) 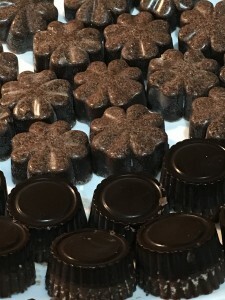 If you want to check it out, and order some to make chocolates, click here. And please contact me if you’d like to learn more about the FUXION opportunity. Posted by administrator in Recipes for Healthy Eating. I love Graham crackers! 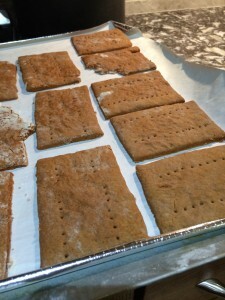 But in an attempt to stay healthy and avoid foods my body can’t tolerate – graham crackers are on the list of stay-away from foods…until I found this gluten-free graham cracker recipe. YUMMY!!! I have to just say that you can’t be in a hurry to bake these. It’s going to take some time. My first batch actually took me three days. I promise it doesn’t have to take this long, but there is a lot of waiting and chilling involved to end up with a good cracker. So patience is important – and I promise it will be worth the wait. Posted by Aliesa George in Food and Nutrition, Recipes for Healthy Eating. 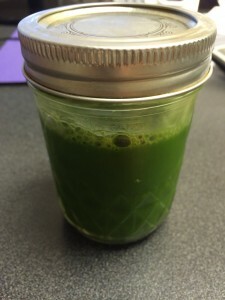 Juicing Benefits: Help I’m Becoming a Crazy Health Nut! Is It Time For You To Start Enjoying The Benefits of Juicing? This month for the first time in my life, I’m JUICING! And I’m afraid that I might be turning into a crazy health nut! But the benefits of juicing are amazing. I have to share with you that depression has played a major role in my life. Don’t like it, but it’s a part of who I am. I was so sad to hear that Robin Williams took his life. What a loss. He was brilliant, funny, really cared about people, and tragically battled depression. If you are not afflicted with this disorder, you will probably never be able to truly relate to those of us that find it a challenge to stay alive, and unfortunately this has always been a taboo topic to talk about. But we really shouldn’t keep it in the closet. Developing a good support system is critical. Some of the support needs to come from others, but we also have to take an active roll in supporting our own health – mental, spiritual, and physical. Why am I sharing this with you? Because the day I reached the end of my rope – was the day I started a water fast, which ultimately led me to try juicing. So for the past almost-fifty years, how have I managed my depression? Exercise has helped to keep me balanced. The harder I work out, the better I feel about being IN my body. Pilates has been a lifesaver! Not only deepening the connection between my mind, body, and spirit – but also being able to pay it forward and help others. Meditation and working on my mindset… (and let me tell you, this is a huge challenge. A depressed brain can really go on a rampage!) And this month for the first time in my life, yep – the new healthy thing for my body – green juice! I’ve always looked at folks who juice as granola-type, hippy, health nuts. Sure I want to be healthy, but is green juice really the answer? And is juicing worth the effort? Continue Reading ‘Juicing Benefits: Help I’m Becoming a Crazy Health Nut! Posted by Aliesa George in Food and Nutrition. 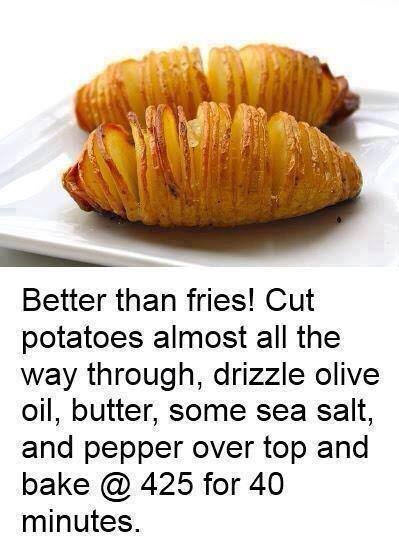 This baked potato recipe looks so good I just had to share. My food allergies and food sensitivities won’t allow me to eat white potatoes or olive oil right now, but with a few modifications, I can’t wait to try this baked potato recipe! I’m going to try it with sweet potatoes, and then am wondering what other veggies might make the cut… Thinking rutabaga’s might work well too! If you decide to experiment and play with your veggies – let me know what else you’ve sliced and baked that worked well to adapt and modify this baked potato recipe for other crisp oven-baked veggies. Gotta give credit where credit is due. I discovered this little gem on my facebook wall, from 1000000 Ideas & Products – a very cool page. Enjoy! Posted by tonyab in Recipes for Healthy Eating. I’ve always preferred real foods to supplements. But sometimes an extra boost of protein can be helpful. Shakes and smoothies are great, but if all you are drinking is concentrated fruit juices it’s more of a sugar shot than a healthy meal. And adding a couple of scoops of protein powder to your breads, muffins, or pancakes can be an easy way to pack more protein into an otherwise carb-laden treat. So how do you find a healthy and tasty protein powder supplement for your shakes and smoothies? Well I believe January has been declared SOUP Month. And there is nothing I love more than a hot bowl of soup on a cold day in the middle of winter. Since my food allergies and intolerances seem to be a moving target, and buying ready-made anything is almost impossible because there are too many ingredients I’m trying to avoid, creating new recipes for things that I CAN eat seems to be my best option for a good meal. Aside from safe, I’m pretty sure a good healthy, home-cooked meal is more nutrient dense and preservative-free. 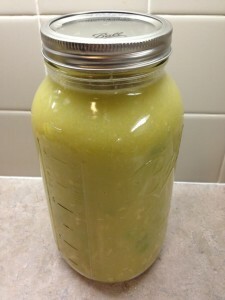 So, I suppose in some ways I’m grateful for being forced into the kitchen to become “Suzie-homemaker.” Since I posted a photo of my tasty dairy-free, gluten-free cream of celery soup recipe on Facebook, I’ve had a few requests for the recipe, so here it is. Whip up a batch and let me know how much you love it!